On my flight back from Riga, Latvia this weekend, I had the unfortunate luck to sit next to a young mom (approx. 20 yrs old) and her baby. I have never seen anyone so ill-prepared to travel with a kid, or to have a kid. 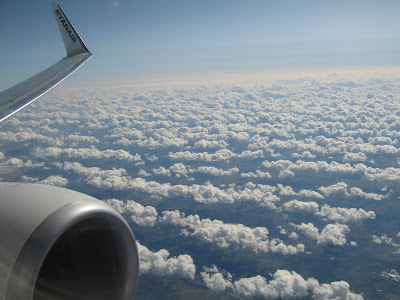 We flew RyanAir which has strict requirements about take-on luggage. Everyone in Europe knows these requirements. RyanAir allows each passenger to bring 1 carry-on (this includes purse or laptop bag - 1 means 1) weighing a max. of 10kilo, and it has to be smaller than certain dimensions. If you go over, the gate attendants will require you to pay a 30EUR fee and check the bag at the gate (they get commision for every bag they catch which is over). When the gate attendants announced that they would weigh all bags, a young mom started lougly arguing with the gate attendant. After 5 min of arguing, she proceeded to plop her baby (roughly) on the floor, search through her bags, and then take baby & some things away from the gate. She left the majority of her luggage sitting at the gate. At this point I boarded. Then 10 min later she re-appeared on the flight and decided to sit next to me (I should have said no). Next steps: she threw her kid on the seat and then took-off 4 (FOUR) pairs of pants, 4 (FOUR) shirt, and 1 coat. In an effort to make her largest bag fit within weight restricitions, she took out all her clothes and put them on. Turns out she had 3 bags + 1 purse + 1 stroller + 1 child, none of which she checked ahead of time. The largest bag wasn't able to fit under the seat or in an overhead bin. She placed it in the aisle between our seats instead. What was she thinking?! During this entire ordeal, her ~1 yr old baby was trying to get to the floor, hitting the tray table, and throwing things from her purse. The only things she brought for her baby (that I saw) were a pacifer, an empty bottle and a bunch of diapers which she tossed all over the seat midway through the flight when she decided to change the baby on the seats (YUCK!!). When packing up the diaper bag, she put the baby on the ground where it fell over and hit it's head on the bottom of the seat. During landing, she was more interested in the conversation with her new friends across the aisle than making sure her baby was sitting down in her lap. People like this should not be travelling with kids, or perhaps not even have kids. Pic1: Random cloud foundations as seen out of the airplane window; the clouds looked like this both on the flight in and out of Riga.